Maglev (derived from magnetic levitation), is a system of transportation that suspends, guides and propels vehicles, predominantly trains, using magnetic levitation from a very large number of magnets for lift and propulsion. This method has the potential to be faster, quieter and smoother than wheeled mass transit systems. The power needed for levitation is usually not a particularly large percentage of the overall consumption; most of the power used is needed to overcome air drag, as with any other high speed train. 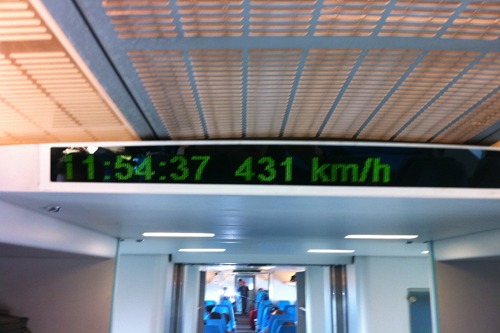 The highest recorded speed of a Maglev train is 581 kilometres per hour (361 mph), achieved in Japan in 2003, only 6 kilometres per hour (3.7 mph) faster than the conventional TGV wheel-rail speed record.